If knitting were an extreme sport, then last night was, like, the knitting equivalent of the space jump. I understand that some folks may think that’s a slight exaggeration, but let me tell you, it didn’t feel that way. So I’m working on a 2 skein giant Haruni. I’m halfway through the last chart when I notice that a few rows back, on just one petal, the ‘stem’ and petal edge jumped a few stitches to the right. My OCD has OCD, so this was enough to give me a fit. Serves me right for trying to watch James Bond movies and knit lace at the same time. Now, tinking was simply not an option. 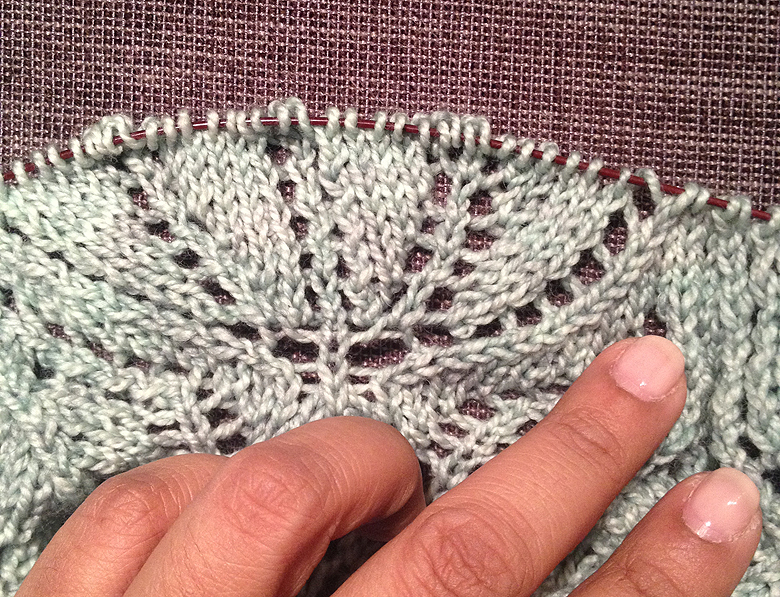 I went for extra repeats, it’s a 2 skein shawl, and there are eight hundred freaking stitches on my needles. Times 6 rows that would need to be tinked. That’s 4800 stitches. That’s crazy talk. I told Tito I was going to fix it. He got me crochet hooks and got out of the way. I put on Leonard Cohen, I got a lot of chocolate, and I went to work. I was too panicked to do a step-by-step photo tutorial, but the genius was all in this post from the Twist Collective by Robin Melanson. I used her lace knitting fix (scroll down a bit to see it). Grab a second dpn and, using the loose strand behind your knitting, ‘knit’ the pieces back up the way they’re supposed to look. I pinned down the piece to my couch, running the pin through the last stitch on the needle to keep it from sliding off and making my problem worse. 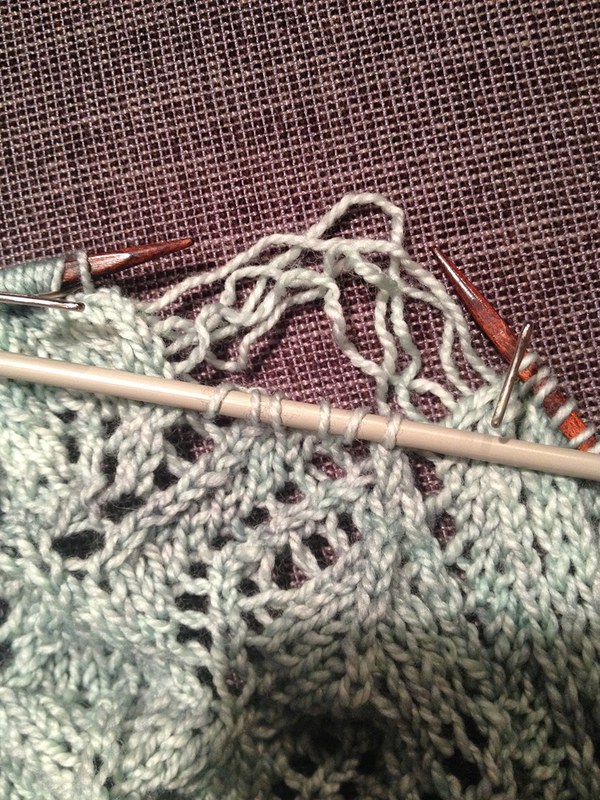 I used a crochet hook instead of another dpn because I found knitting from the little strand too fiddly otherwise. 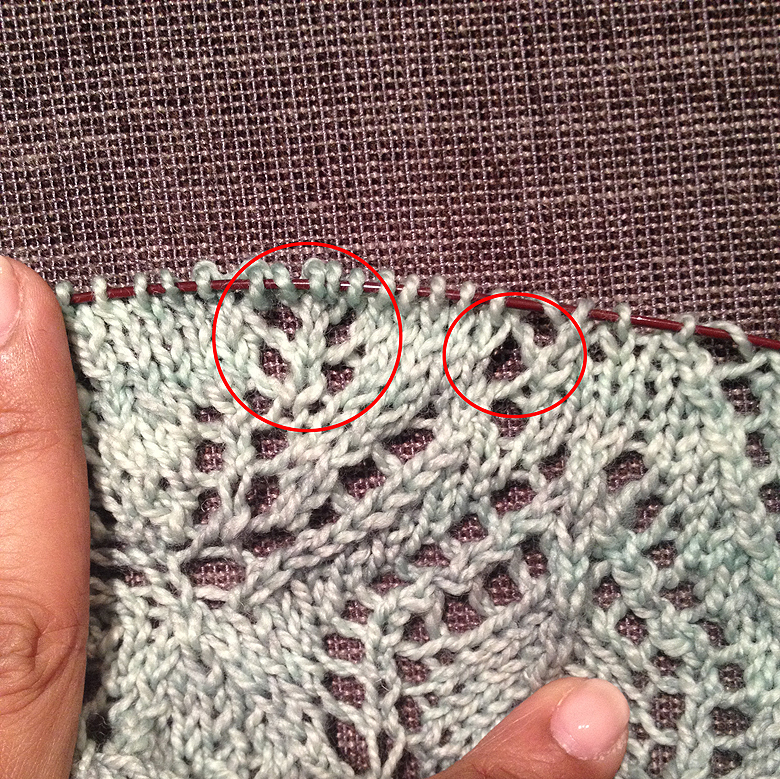 I divided my problem into 2 sections, the ‘stem’ and the ‘edge’ so that I was fixing fewer stitches at a time instead of having the entire area to re-knit. It’s tricky; you have to remember where your decreases were, and your yarn-overs so you can put them back in. 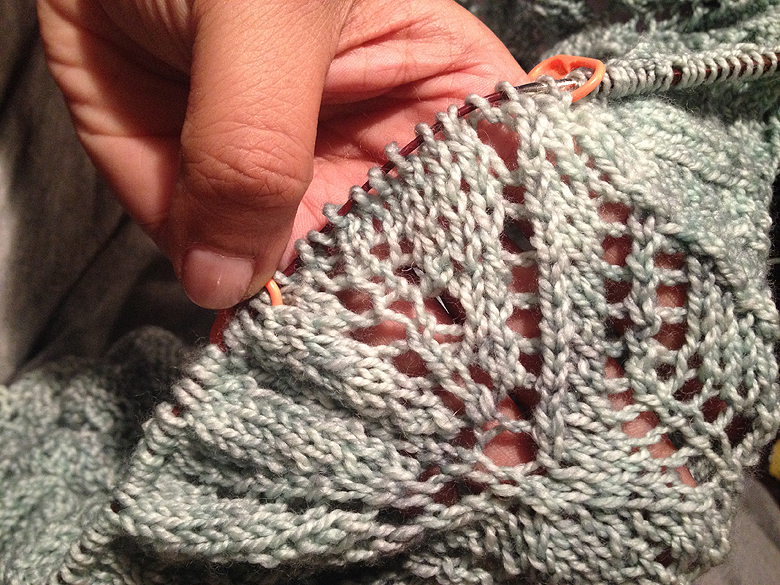 You have to remember to add a row of plain knitting above the lace (the equivalent of purling back over the row), and you get seriously sweaty palms from the stress alone. In my case, the number of stitches I unraveled to was not the number I needed to have back on the needles at the end because of the increases in the intervening rows, so being able to read your knitting is a must. The results are definitely wrangled-looking but I think that will block out. Sure beats the alternatives of tinking almost 5000 stitches, or having to live with the wonky petal! The wrangled, but correct result. Well done! You’re a brave girl, Shireen. I haven’t even tried ‘lace’ yet in my knitting. Great job! Eunny Jang has a lesson on this kind of troubleshooting (http://www.craftsy.com/class/lace-knitting-basics-and-beyond/) and I do agree this “lace surgery” makes for an extreme sport! Yay! I’ve done similar things with lace. Panic-inducing indeed, but you feel so great after you’ve fixed it! Q – Nice save! If I’m going down just a single row, I use one of those orange “safety pin” thingies to put into the bottom stitch instead of a double pointed needle.